Help the mischievous Pandas escape from the zoo and in return you could be on the receiving end of some lucrative free spin bonuses. Witness these bamboo-loving bears perform circus tricks and keep an eye out for the insane Pandamania bonus icon in this online 5 reel online slots game. Spin the wheel today and play slot online. After spending 18 years establishing a strong and secure reputation in the slot-game industry, it is safe to say that NextGen knows what they are talking about. NextGen are primarily a slot developer and their games can often be found at Casinos working with the NXGaming platform. However, they have also gained a huge amount of experience making their own games too. 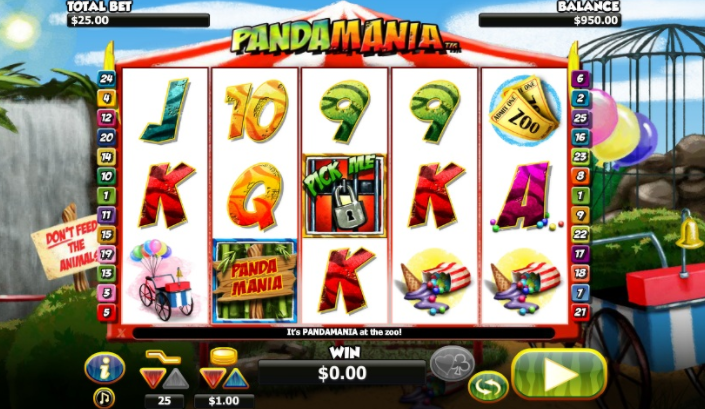 Oriental themed games have become commonplace in the casino world so it may be easy to overlook NextGen’s version with their online slot games, Pandamania. However, they have truly reinvented the theme as they have broadened the background to the game as a zoo whilst keeping the much-loved panda at the center of attention. Visit EasySlots.com, for more various promotions! The vibrant colours and imagery in this zoological slot-game are exactly what you would expect at the zoo, and so immediately you become immersed in the world of the animal kingdom, without the unnecessary hot weather or the annoying tourists. There is a panda running loose in this zoo who is willing to help you win the big money, as he represents the wild card. This 5-reel slot with 25 pay-lines offers three bonus features. The first is activated randomly at the end of each spin, Panda will cycle across the wheels turning random symbols into wild symbols. The padlock bonus enables you to pick a random prize by clicking on certain padlock symbols. Prizes here vary from free spins to multiplying your original bet. 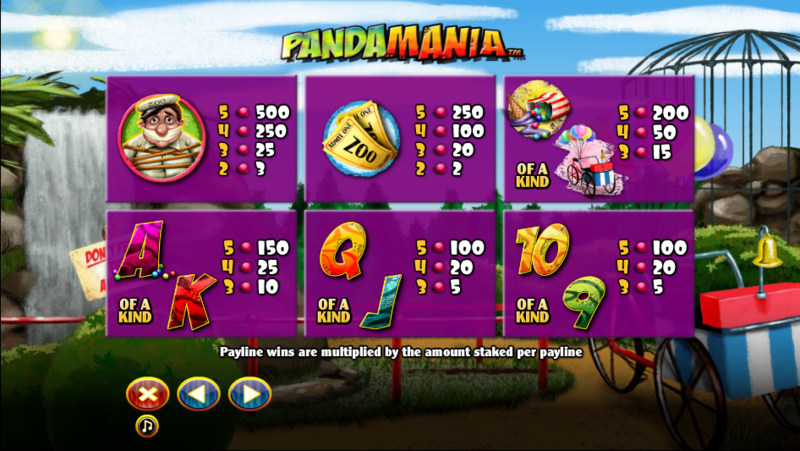 Lastly, the ‘Panda Mania logo’ scatter symbol is a highly prized possession, with 10 free spins being awarded for 3 logos being present anywhere on the reels. As an extra beastly bonus, each win within these free games will be doubled! During these free games, the Panda escape bonus, as mentioned earlier, will become a more frequent event – this is a wild winner in our books! As an even better bonus, if you land another 3 or more logos, this feature will be re-triggered – it’s a game that just keeps on giving! Bets start at just 1p a spin up to £2 so there really is every temptation to give this slot-game your best shot, with so many ways to win, the odds are incredibly in your favour! Discover our top casino games here. Like most other slot-games, you will also be given the chance to gamble your current earnings and this can be activated by clicking on the Heart&Clubs. This is where you can double or quadruple your winnings. Guessing the colour of your card will double your winnings and guessing the suit will quadruple them, click now! With a minimum spin of 1p and a max of £2, this fantastically wild slot-game is surely worth a shot. To be immersed in such a friendly, colourful animated world jointly with the varied ways in which you can discover more than just animals, but discover a small fortune too! An equally hilarious game is our Irish Eyes.